Make a harmonious first impression on your customers with our Clef business card design template, an imaginative choice for musicians, music supply stores, and other music-related professionals. 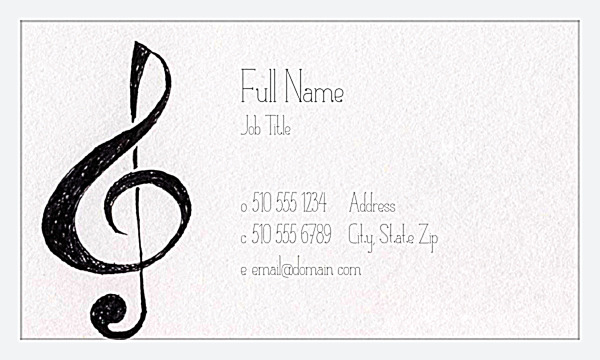 Clef’s two-sided design features a treble clef on one side with your name, title, and contact information. 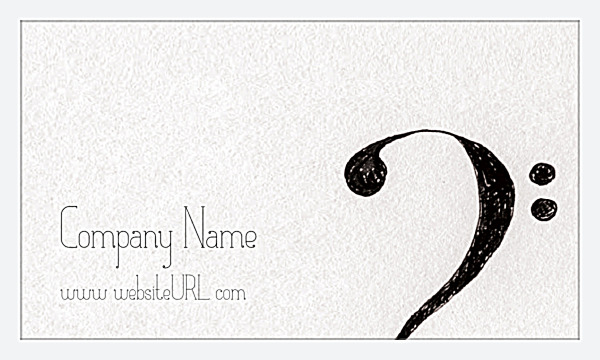 The other side displays a bass clef with your company name and website. Customize Clef with your choice of four mellow colors and four attractive edge finishes. Adjust the font style, size, and color to compliment your business’s brand. It only takes a few minutes to create your own custom business card – designer not required! With our easy-to-use design tool, you can create an attention-getting, professional-looking business card in just minutes. Simply use the point-and-click app to create a business card with colors, fonts, and text that match your business. Whether you’re looking for a standard business card or something with a little more moxie – such as our triple-thick ultra business card, folded business card, or a writable uncoated business card – PsPrint’s online business card maker makes it easy to print amazing business cards that will have customers signing your praise. Premium paper stock, vibrant soy-based inks, and high-quality printing are hallmarks of PsPrint, the perfect print marketing partner to help your business grow. Of course, every project is backed by our customer satisfaction guarantee, so you know you’re getting an incredible business card at an amazing price. Print a smash hit with PsPrint!